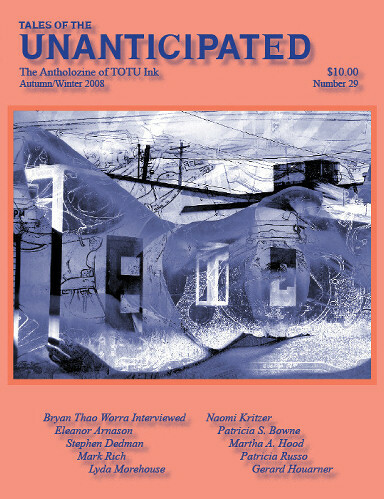 Includes fiction by Patricia S. Bowne, Mark Rich, Lyda Morehouse, Eleanor Arnason, Stephen Dedman, Martha A. Hood, S.N.Arly, Stephen Couch, Michael A. Pignatella, Katherine Woodbury, Gerard Houarner, Naomi Kritzer, Patricia Russo, Tony Pi, Hank Quense, and Sue Isle; an interview with Bryan Thao Worra by Catherine Lundoff; and poetry by Kristine Ong Muslim, Terry A. Garey, Ann K. Schwader, Camilla DeCarnin, Sandra Lindow, F. J. Bergmann, Cornelius Fortune, James P. Roberts, Terry Leigh Relf, and Martha A. Hood.